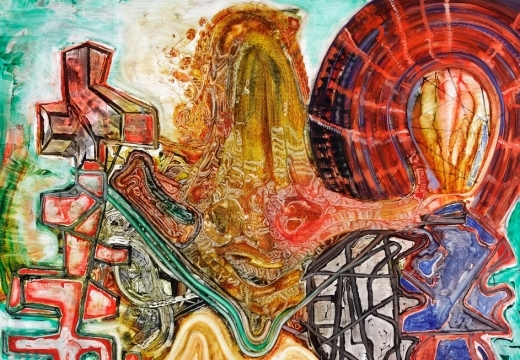 Nolan/Eckman Gallery is pleased to announce an exhibition of recent drawings and paintings by Steve DiBenedetto. 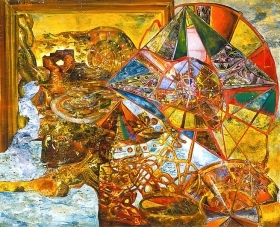 DiBenedetto has been showing his paintings in New York since the 1980's, and through that time he has created a cosmology, a visual toolbox, around a group of motifs: ferris wheels, helicopters, octopi, dilapidated tv sets, and haloed figures glowing with energy. These elements inhabit eerie, industrial wastelands and cavernous, menacing reliquaries. 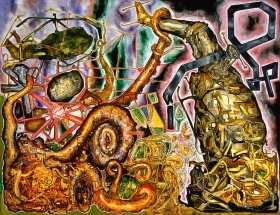 The viewer is restlessly bumped around each mesmerizing component in an imminently self-destructing and at the same time wildly regenerating world; the eye ricochets from point to point, slithers from one embellishment to another. DiBenedetto's furiously-worked oil paintings, composed in a dense palette of decaying, mucky tones, are sometimes created over the course of several years. 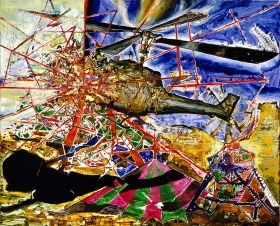 Determinedly other-worldly, a meticulously ornate surface broadcasts the hallucinogenic, techno-shamanist writings of Terence McKenna and the metaphysical ruminations of Arthur Young, the inventor of the famous Bell helicopter. 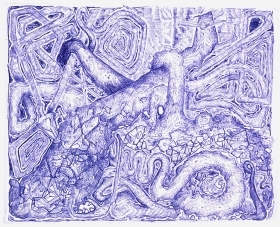 They have absorbed early Surrealism à la Salavador Dalí and Roberto Matta, with a hint of the decalcomania of Max Ernst, while the dynamic and stark graphite lines of the drawings have an animated control reminiscent of Terry Winters' geometric explorations. 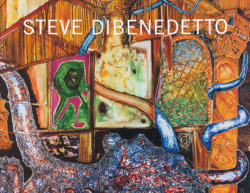 Born in 1958 in the Bronx, Steve DiBenedetto has recently been featured in the exhibition Remote Viewing: Invented Worlds in Recent Painting and Drawing at the Whitney Museum of American Art, which will travel to the St. Louis Museum of Art next year. This is the artist's first exhibition at Nolan/Eckman Gallery. A hard bound catalogue of the exhibition, with an essay by Klaus Kertess, is available for $40. Please contact the gallery for more information.